1Fachbereich Physik, Philipps-Universität Marburg, Marburg, Germany. 2Wissenschaftliches Zentrum für Materialwissenschaften, Philipps-Universität Marburg, Marburg, Germany. 3Fachbereich Chemie, Philipps-Universität Marburg, Marburg, Germany. 4Institute of Experimental Physics I, Justus-Liebig-University, Giessen, Germany. Tailored light sources have greatly advanced over the past decades. In particular, the development of light-emitting diodes (LED) was the last milestone in the field of illumination. This includes the virtually omnipresent white LEDs where ultraviolet emitting gallium nitride (GaN) LEDs  excite light converting phosphors to cover the visible spectrum. They are reasonably priced and are starting to replace incandescent or compact fluorescent sources for lighting and display applications [3,4]. For many scientific uses, the development of the laser was a comparable milestone . Lasers are light sources with well-defined and well-manageable properties, making them an ideal tool for scientific research. Nevertheless, at some points the inherent (quasi-)monochromaticity of lasers is a drawback. Using a convenient converting phosphor can produce a broad spectrum but also results in a loss of the desired laser properties, in particular the high degree of directionality. To generate true white light while retaining this directionality, one can resort to nonlinear effects like soliton formation . Unfortunately, nonlinear effects usually require large field-strength, thus large-scale, expensive pulsed or high-power lasers. On the route towards a more favorable solution, we recently presented an amorphous cluster compound that converts the infrared (IR) light of a reasonably priced laser diode into a broad visible spectrum while retaining the desired laser properties . The compound contains clusters with a tin-sulfur based core and four organic ligands per formula unit. The core is composed of an adamantane-like scaffold, [Sn4S6]. It has a tetrahedral shape and is thus lacking inversion symmetry. This is accompanied by a random orientation of the four ligands R = 4-(CH2=CH)-C6H4 (Fig. 1a). The ligands consolidate the structure of the core [8,9] and prevent crystallization of the compound, hence prevent any long-range order. As a result, the compound is obtained as an amorphous white powder (Fig. 1b). Figure 1: (a) Molecular structure of the adamantane-like cluster molecule, with tin and sulfur atoms drawn as blue and yellow spheres, respectively; carbon (grey) and hydrogen (white) atoms are given as wires. (b) Photograph of the as prepared powder. Upon irradiation with infrared laser light, the compound emits a warm white-light (Fig. 2a). Its spectrum is virtually independent of the excitation wavelength in the range from 725 to 1050 nm. Variation of the laser intensity, however, results in a slight shift of the spectral weight towards higher energies for higher intensities (Fig. 2b). This common impression of a dimming tungsten-halogen light bulb could lead to the assumption that the novel light-emission is also thermal. However, the input-output characteristic of the white-light process scales highly nonlinear. Additionally, the emitted intensity depending on the color temperature of the observed spectra differs vastly from the Stefan-Boltzmann law. These two points exclude a thermal process to be the source of the observed white light. Furthermore, spontaneous emission can be ruled out: exciting the compound above the absorption edge, i.e., with photon energies above 3.0 eV, changes the emitted spectrum drastically. Figure 2: (a) Photograph of the cluster compound embedded in a polymer and sandwiched between two glass slips. The compound is excited in the bright center spot, using 800nm laser. (b) White-light spectra for different pump intensities, from low (grey) to high intensity (black). For reference, the emission of a black-body emitter at 2856K is shown. The largest advantage application-wise is found in its directionality, i.e., the angular emission characteristics. When the sample is excited in a transmission like geometry, the spatial distribution of the white-light is found to be very close to that of the driving laser. In combination with the very low threshold of the nonlinear process, this enables the use of this light source for many applications where a broad spectrum and low-etendue are required, e.g., in microscopes or optical coherence tomography systems. To explain the white-light emitting process, we developed a semi-classical model. This model ascribes the white-light emission to the driven movement of an electron in the clusters ground state potential. During this process, the electron gets accelerated by the IR-laser and subsequent deceleration of the electron leads to the emission of radiation just like Bremsstrahlung. Implementing this process numerically leads to an excellent agreement of theory and experiment. While such anharmonic oscillator models are commonly applied for nonlinear optical phenomena, here, the shape of the simulated ground state potential is completely based on experimentally verified parameters and results from first-principle calculations. This model does not yield the observed directionality that only could be ascribed to a phased-array effect caused by the driving continuous wave-laser. Finally, we find that the compound can be used to coat semiconductor substrates like gallium arsenide or silicon. This enables the possibility of functionalization of well established III/V semiconductor laser diodes. H. J. Round, “A note on carborundum”, Electrical World, 49.6, 309 (1907). Abstract. Shuji Nakamura, Takashi Mukai, Masayuki Senoh, “Candela-class high-brightness InGaN/AlGaN double-heterostructure blue-light-emitting diodes”, Applied Physics Letters, 64, 1687 (1994). Abstract. Fred Schubert, Jong Kyu Kim, “Light-emitting diodes hit the centenary milestone”, Compound Semiconductor, pages 20-22 (October, 2007). Article. Siddha Pimputkar, James S. Speck, Steven P. DenBaars, Shuji Nakamura, “Prospects for LED lighting”, Nature Photonics, 3, 180–182 (2009). Abstract. T. H. Maiman, “Stimulated optical radiation in ruby”, Nature, 187, 493–494 (1960). Abstract. Robert R. Alfano, "The Supercontinuum Laser Source" (Springer, 2013). 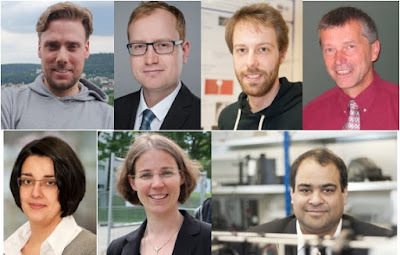 Nils W. Rosemann, Jens P. Eußner, Andreas Beyer, Stephan W. Koch, Kerstin Volz, Stefanie Dehnen, Sangam Chatterjee, “A highly efficient directional molecular white-light emitter driven by a continuous-wave laser diode”, Science, 352, 1301–1304, (2016). Abstract. Hermann Berwe, Alois Haas, “Thiastannacyclohexane (R2SnS)3 und -adamantane (RSn)4S6 Synthesen, Eigenschaften und Strukturen”, Chemische Berichte, 120, 1175–1182 (1987). Abstract. Jens P. Eußnera, Stefanie Dehnen, “Bronze, silver and gold: functionalized group 11 organotin sulfide clusters”, Chemical Communications, 50, 11385–8 (2014). Abstract.